This Algarve villa, Orange Cottage is a large two bedroom rustic cottage and decorated in traditional Algarvian decor with white washed walls. There is a fully fitted kitchen including oven and stove, fridge with freezer compartment, microwave, electric kettle and toaster. The Lounge/diner is tastefully decorated with cane and pine furniture, Satellite TV, video recorder and radio/CD player, a section of reading books, puzzles, chess set, playing cards, ceiling fan and the cottage also boasts an original 19th century fireplace that now houses the wood-burning stove. Double doors lead onto the very large south-facing private terrace with it's own table comfortably seating six people, cushioned seating, cushioned reclining chairs and a brick built Bar-B-Q area. There is also a large covered terrace with a cane ceiling and wooden beams for al-fresco dining. Vibrant bougainvillea drapes the exterior, and there are rock gardens and pot plants sprinkled all around, with shrubs, palms, and fruit trees all producing an air of peaceful tranquillity. The bathroom has a new luxury double walk-in shower, washbasin, w.c. bidet, shaver point and a sloping wooden ceiling. The Orange Cottage bedrooms consist of one double bed and one twin bed. Both bedrooms are tastefully decorated to very high standards and have sloping wooden ceilings. There are fantastic panoramic seaviews and spectacular countryside views, just what you need for a tranquil and relaxing holiday. The gardens are marvellous with many bushes, plants and fruit trees, along with quiet areas to relax and absorb the views. 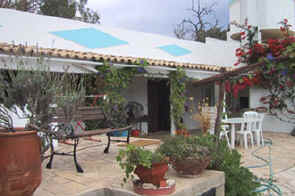 There is a large swimming pool available which is shared with 3 other cottages. The pool measures 10 x 5 m and cushioned sun loungers and parasols are provided for the use of the guests. On arrival you will be met and awaiting your arrival will be a very generous welcome hamper in your accommodation compliments of the owners. For all the adult guests, bathrobes are provided for use during their stay, pool towels are provided (on site use only) and the cottages have hairdryers and alarm clocks. The cottage also has a radio/CD player – guests are asked to bring their own CDs. On selected evenings of the week, there is also an evening meal option. Traditional home cooked Portuguese cuisine is served on the owner’s private terrace, which has spectacular views over Loulé. What a better way to end your day with a nice meal and a glass of delicious Portuguese wine. There is a returnable security bond of £300 for this cottage. This bond will be returned after your holiday providing the cottage is left in a clean and tidy state and that there are no breakages.